ASIAN KUNG-FU GENERATION’s (AKFG/Ajikan) upcoming ninth studio album Home Town is their first in three-and-a-half years, and it’s truly a fantastic record. 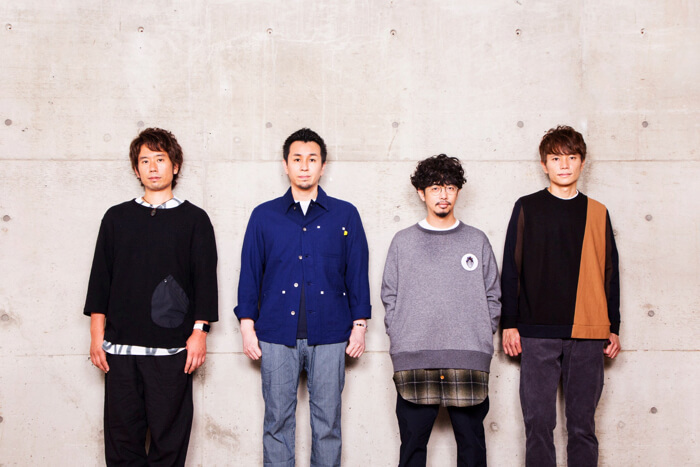 It’s interweaves elements of 90’s power pop and alternative rock―genres which the members have come to be influenced by―while still being firmly in tune with today’s trends. The masterpiece mobilises a musical battalion of distinguished names such as Rivers Cuomo of American rock band Weezer and yet still is in every way a quintessentially AKFG record. The key to understanding this can be found in the changes to their music production environment. We spoke to the four members about the backstory of creating Home Town which they described as having been “so much fun” and about their connection to the rest of the world as having travelled around the world. Goto: At the beginning we were invited to events like Japan Expo in Chile, so we decided to continue with that line of things and go on tour. We went to Argentina, Brazil and Mexico. We were surprised at how many fans we have in South America. It was fun, and a really wonderful experience. We want to try going to many more countries. Goto: They do. When we go to Europe it’s songs like Siren which is multilayered and played in minor key. The songs that sounds like British rock are received well, but our less-known songs not so much. Though they’re well-received in South America. ―Did you ever envision yourselves touring the world when you formed the band? Goto: We had that mindset surprisingly early on. Our band name ASIAN KUNG-FU GENERATION, for example. We felt we would stand out better when performing around the world if they thought of us as an Asian band. Also, when we debuted, our song Haruta Kanata was used as the opening theme for the anime Naruto. It was a time when there was still a strong air that questioned a rock band performing an anime song. But we all said to each other that by doing it together with a show like Naruto, our song would travel across the ocean and be shared throughout the world. That’s why from then on we purposely incorporated Asian melodies and it’s something we’re still conscious of. And it’s proven true that the people of the world enjoy those kind of melodies.